The company Stela Steuerungs- und Elektrotechnik has been spezializing over decades in switchboard engineering, electrical installation, commissionings and maintenance as your reliable partner. We offer in-house electrical engineering, automation engineering, process visualization, switchboard engineering and process measuring and control technology. These services can be rendered, depending on the customer request, separately or as complete contract. We undertake the coordination of the tasks. A project manager attends to you in all technical and commercial concerns; consequently hidden costs are avoided by omission of interfaces, resulting in optimum project transparency. Benefit from our qualifications for individual and economic solutions. We design logical conceptions and cooperate closely with our customers as an optimum basis for a successful project. Our experienced project managers advise our customers during the whole project handling. 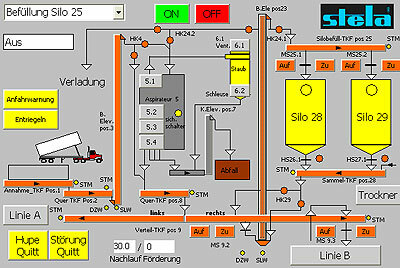 If you want to automatize your plant, we are at your disposal with our know-how. We offer tailor-made solutions for individual requests. Efficiency and functionality are in the foreground. The close cooperation with our customers guarantees a successful project. Project management with Stela means comprehensive customer support from the counseling interview up to commissioning and maintenance. Qualified personnel, employed for many years, handle your project professionally. The project manager as contact person coordinates permanently the individual work steps up to the completion on schedule. The plants are projected by means of the most modern CAD technology. 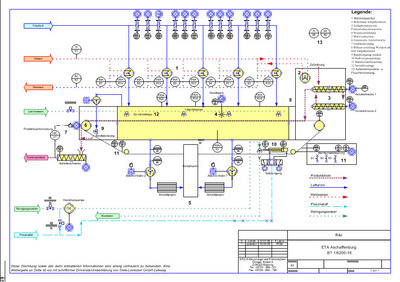 We use "EPLAN 21" & "EPLAN" as CAD system. In order to guarantee a smooth handling, our in-house departments like e. g. CAD- PLC- production work hand in hand. The documention includes, according to the customer's requirement, circuit diagram, PLC lists, terminal diagrams, parts lists, cable lists and data sheets of the process measuring and control technology. Experienced project managers coordinate the execution of connected partial processes for the customer, according to our motto "Everything from one source"
We are at your disposal as competent partner also after completion of the project. Professional analyzing of operating conditions to safeguard your production. Regular maintenance of your technical facilities to guarantee safe operation. You can reach our on-call service any time. You will receive the whole spectrum of automation on hard ware basis indepedent of the manufacturerer. We help you with regard to design and realization of your new plants and the upgrading or modification of existing systems. STELA programming by Moeller SPS and S5/S7. Visualization solutions for management information systems, control centers, terminals etc. If you want to optimize your production by using new control technologies, use our experience in the field of visualization. Tailor-made customer solutions like e.g. inline moisture measurement FRA 450. 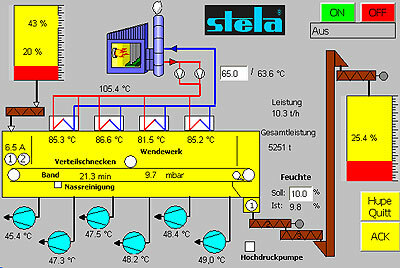 This system is used in drying plants. The moisture is measured in the production flow and the values are passed to the PLC. The retention time of the product is controlled by the control algorithm. Our moisture measurement system has proven itself by the use for many years and our experience in the field of drying products; this is also confirmed by our customers. 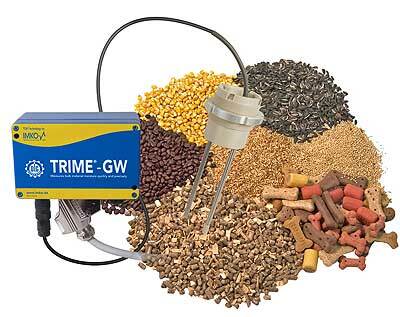 Using the Trime sensor, a continuous online measuring of the product to be dried and the processing of the measured values into our automatic control system is possible. This results in a constant final moisture as requested.